The original High-Rich Hydrogen Water Machine (the best little hydrogen water generator that I've tested) just got better! It uses the latest, most improved version of the DuPonte SPE-PEM membrane. The High Rich II has better electronics than the original High-Rich. 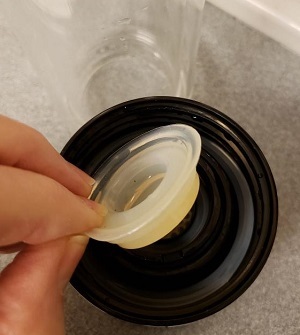 It is very user-friendly and can connect up directly to almost any water bottle if you prefer that to the cup (pictured). The High-Rich II is truly the best little Hydrogen Machine ever. See the videos, below, for a complete demonstration of this great new product! With the High-Rich-II you can use regular tap water, filtered water, reverse osmosis water, or distilled water to make hydrogen-rich water. You can use this product page to buy the machine itself or any of the listed extra parts for the High Rich machines. If you want more than one of the multiple choices, then please back-arrow into this product page again once you've added each item to the cart. Why is High-Rich So Special? The High-Rich machine has a special membrane which pumps pure hydrogen into the water and at the same time pumps out chlorine, oxygen and nitrogen. This is significant in improving the health-qualities of your water in a multitude of ways. The heart of any hydrogen machine is the membrane and plates. The SPE-PEM membrane in the High-Rich machines is made by DuPont in the USA. 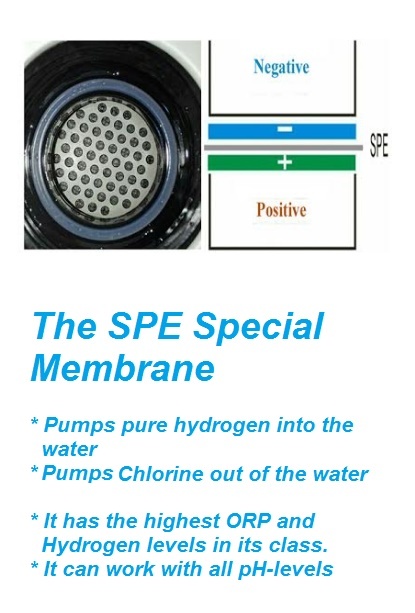 The Proton exchange membrane (PEM) is basically a special membrane developed by DuPont to create an environment of electrolysis where hydrogen rich water is created in a healthier way than the normal 2 or more plate hydrogen pumps to date are using. With PEM technology some unhealthy elements are removed by way of this special membrane. DuPont uses platinum in their electrodes which are embeded into their own patented SPE/PEM membranes for the finest quality and most efficient hydrogen pumping techniques in the world. The heart of the High-Rich machine is this USA-Made SPE-PEM Membrane. The rest of the machine is made in China. Filtration: Most portable Hydrogen Machines are unable to do much filtration, but because the High Rich pumps out the Chlorine and Nitrates, you get a fairly good level of filtration as an extra important benefit. The filtration comes out the bottom as gasses, mainly, but there may be drops of water that collect in the tiny bottom bin which can be removed and emptied if this occurs. The taste of the High-Rich water is improved over regular tap water, because of the chlorine and nitrogen removal. Note: The High-Rich water machine does not significantly change the pH of the water. For drinking water, use water with a neutral or above pH. For beauty-water (on the skin) use water with an acidic pH. Also note that the High-Rich machine receives factory testing to ensure quality. For this reason there is often a small amount of water in the machine when it arrives to you. This is normal and it means your machine underwent high-quality testing at the factory. Plate Materials: Pure Platinum Coated over Pure Titanium. Rechargeable battery, lasts for 10-20 uses between charging. Can hook it up to a bottle of your choice (i.e., bottled water of varying sizes and volumes). Before using, remove and wash the glass enclosure and the lid. Use warm water to clean with. Rinse thoroughly. Make sure to remove the plastic barrier and rubber plug which covers the main machine membrane chamber (base). Save the plug, because you may want to use it again when you're traveling or shipping it. During operation you should see bubbles coming out from the bottom. The bubbles are pure molecular hydrogen being pumped into the water. By the way, nitrogen and chlorine gasses are being pumped out through a tiny hole in the base. If you don't see a lot of bubbles, follow the steps under the section, "How to Moisten Up a Dried Out Membrane", below. Hydrogen is a gas, so after preparing the water, try to drink it fairly quickly (within an hour) after. You can see the Hydrogen tester at the end of the video shows that even less than a minute of pumping hydrogen into the water it is approaching the saturation point for hydrogen dissolved in water and good to drink. The cycle takes 5 minutes (blue light), or you can give the button another push to get a green light, which will boost the cycle to 7 minutes. There is no use to try to pump more molecular hydrogen into water than this and can needlessly wear out your hydrogen machine to do more cycles. There is a danger if you build up too much pressure inside the bottle it may burst and break the machine, so make sure to open the lid periodically. Use care not to splash water into electronic port or let the water dribble down the side of the cup and into the port. Do not immerse the machine in water. Charge the machine for 4 hours before the first use, and then after several uses recharge it. The red light flashes when charging and stops flashing when charging is complete. I suggest that at the end of each day to plug it in overnight (similar to a cell phone). This should be sufficient. You can use it, while it's charging. No need to wait. Do not pour boiling water into the cup. The use of very hard water or already ionized water in the High Rich is not recommended. It may cause the membrane to scale up and need extra anti-scale treatments. Pour water into the cup and push the button to turn the hydrogen machine on. Don't overfill. Leave about a half-inch space at the top of the cup. Pushing the on/off button once turns the indicator light blue and starts a 5 minute cycle. For a longer, 7-minute, cycle to produce even stronger hydrogen water, press the button twice (till it turns green). Don't use it longer than 2 cycles in a row without a break. The High-Rich machine is not meant to be operated under pressure. It is possible that if you continue to run the machine for several cycles without opening the lid it may burst or break the machine. You can drink right out of the bottle or pour the water into another bottle or glass. It's best to drink hydrogen water within an hour of making it, to make sure the hydrogen-levels are still strong. If during making hydrogen water the device indicator light starts to flash, it means the battery is low and will need to be recharged soon. There is a tiny bin at the bottom of the High-Rich Machine. It may need to be periodically emptied if water collects there. Usually the wastes come out as gasses, but occasiionally droplets of water come out in the bin. You should check it periodically. Simply unscrew the bottom piece under the base and pour out the little bit of water if there's any in there. The amount of water collected (if any) will vary by machine and source water, so I suggest you check it once every day at first (until you get used to what to expect). If you notice lots of water collecting every day, you are probably operating the machine under too much pressure. Re-read above instructions about operating this machine under pressure. It isn't advised. Keeping the Membrane Moist: It's best to use the High Rich Machine frequently throughout the day rather than just once or twice a day. If you don't use it frequently then it's suggested that you put the plug back onto the opening at the top of the membrane chamber. Another way to keep the membrane moist is to put a small amount (tsp.) of distilled water in the chamber of the cup between uses to keep the membrane from drying out. See the next section if the membrane does dry out. If the membrane dries out you won't see bubbles (which means it isn't pumping Molecular Hydrogen) until you moisten it back up again. How to moisten the membrane back up: Fill the cup with pretty HOT (but not scalding) water and press the button to show the blue light. Let it run for about 10 seconds and then turn it off. Let it sit for 1/2 hour. Then try it. It should work; you should see more bubbles. If this doesn't work, try it again. If you see improvement, but not good enough yet, then do it again. If you see no improvement in the amount of bubbles, then do the anti-scaling, described in the next section. You may have to do periodic anti-scaling of your High-Rich Machine. How often will probably depend on your source water. Only do this if you notice the amount of bubbles generated is significantly reduced. Here's how to do it. Put a mixture 1 part vinegar to 3 parts pretty HOT (but not scalding) water into the cup. Turn the machine on for 10 seconds. Turn the machine off and let it sit for 1/2 hour. Empty the solution from the cup, rince and try it. If that doesn't work, try it again, but this time leave it overnight to soak. Note: We don't ship this product internationally due to risk of damage from shipping. Warranty: 1 Year with normal use as described on this page.